Naturally Awesome fact! Scientists aren't sure why, but scorpions are fluorescent under ultraviolet light. 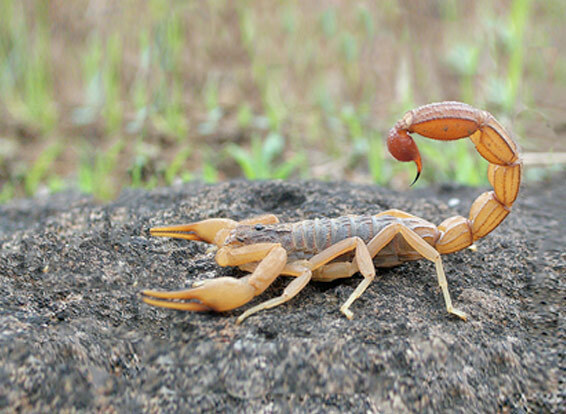 There are almost 2,000 scorpion species, but only 30 or 40 have strong enough poison to kill a person. Scorpions typically eat insects, but their diet can be extremely variable—another key to their survival in so many harsh locales. When food is scarce, the scorpion has an amazing ability to slow its metabolism to as little as one-third the typical rate for arthropods. This technique enables some species to use little oxygen and live on as little as a single insect per year. During our Gobi Desert trek scorpions were our constant companions. At times we felt over-run by the little pests; they were becoming an increasing problem. Although usually not deadly, their strike can be painful and cause serious swelling. Each morning we checked our gear carefully to be sure that none were packed up, waiting to strike with their venomous tails when we set up camp the next night. One morning, just as I stuffed the tent into its bag, a quick strike to my left hand from an overlooked scorpion sent a hot pain shooting into my hand and wrist. I let out a shocked cry and grabbed my arm to stop the poison from traveling. The tissues of my lower arm swelled and throbbed. With my left arm useless, Bill finished loading the camels while I figured out how I was going to hold a trekking pole in my hand. But my fingers wouldn’t cooperate. I would have to use only one pole until the pain and swelling subsided. Throughout that day the pain was almost unbearable. But the scorpions weren’t finished with us yet. That night Bill put on his fleece jacket to guard against the night chill and took over the main job of setting up camp while I rested my throbbing arm. Suddenly with a loud curse he tore off his jacket and grabbed his shoulder and doubled over in extreme pain. Four scorpions fell to the ground and scurried away. I helped him into the tent and he collapsed, groaning across his sleeping bag. Swelling from four puncture wounds traveled across his shoulder. He lay back in agony but soon shivered with chills and complained of a severe headache. I offered him soup but he was too nauseous to eat. As Bill’s fever worsened I could only sit at his side and offer words of encouragement. In the dark of the night desert we seemed more isolated than ever as Bill’s pain and fever worsened. Hoping that everything might look more optimistic in the daylight. I tried to sleep. But it was useless. I felt a cold stab of fear for his safety. We were hundreds of miles from any medical facility. 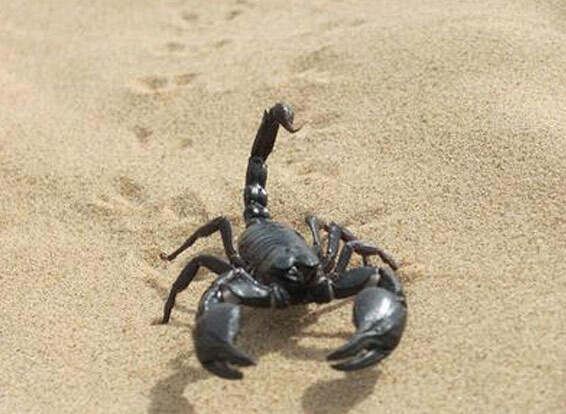 In our research at home we had discovered that of the many species of scorpion only a few could kill or even cause serious illness. Even in the Mongolian capital we hadn’t found anyone who could tell if the Gobi scorpions were dangerous. Finally about three hours later his fever began to subside and he gradually improved. By next morning he could eat again. To stay on schedule we decided to travel once daylight arrived. Breaking camp and loading the camels was a challenge given that we had only one good arm each. It was 9 A.M. before we left. But Bill’s painful swollen shoulder and my throbbing arm meant a slow day. Gradually over the next day or two the pain and swelling left us. From now on we were almost paranoid in our morning search for scorpions in our gear as we broke camp.